Does middleweight king Gennady Golovkin still have to move up in weight to be considered a “real” great? Not too long ago, Gennady Golovkin spoke of the possibility of moving up a division to super-middleweight – if “a big fight is there.” Go back a few months, and the critics were telling everyone how GGG “has” to move up if he’s to be remembered as a true great. Do people still feel this way after all Triple-G has achieved as a middleweight? Does a fighter, especially these days, have to go up through the weight classes, winning world titles in each one as he goes, to become a true great? It seems, with the vast number of weight classes there are in the sport today (certainly vast in comparison to the traditional 8 weight classes of yesteryear), fans have an urge to see a talented champion move up to try and conquer another weight class almost as soon as he has collected belt-one. 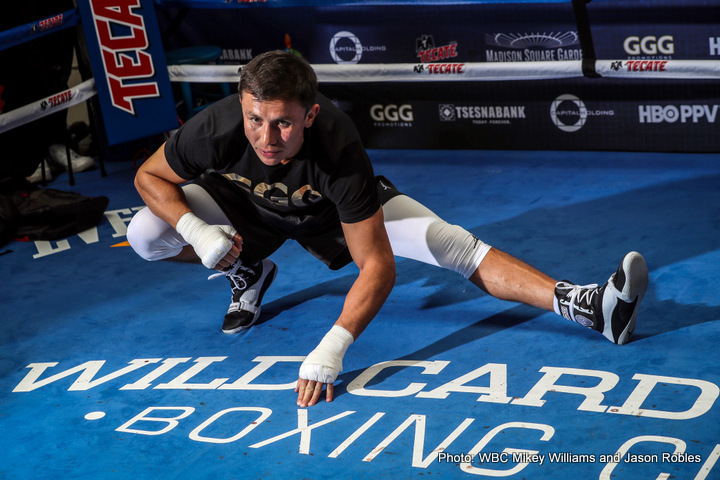 Case in point was, and maybe still is, depending on your view – middleweight king Gennady Golovkin. GGG has pretty much cleaned up the 160-pound division (save getting and winning that rematch with Canelo Alvarez; if it ever takes place now!) yet there are still suggestions (if not as forceful as they were a year or so ago) for him to move up, not only to 168-pounds but also to 175-pounds. Is this asking too much of a fighter who is not that big for a middleweight in the first place? Does GGG still need to do so to become a true great? Does Golovkin, or any modern day fighter, have to conquer, say, two or three weight classes to be considered a true great? Didn’t Marvelous Marvin Hagler, a fighter GGG has been compared to by some, stay at 160 his entire career? Yes. And isn’t Hagler recognised by everyone as both an all-time great and a legend? Yes again. In fact, it is a special discipline in itself, staying at one weight for such a long time, never getting out of shape or lazy and needing to move up. If GGG, 37-0-1 stays at middleweight and continues dominating the way he has been, and if he breaks the record for most middleweight title defences (currently still held by Bernard Hopkins) wouldn’t that be greatness right there? Golovkin doesn’t have to go anywhere weight-wise. If he chooses to go up, fine, but his legendary status will be secure if he is able to maintain his middleweight dominance. And can you really see any current middleweight beating Golovkin? Maybe you can see Vanes Martirosyan upsetting GGG on May 5! You are here: Home / Boxing News / Does middleweight king Gennady Golovkin still have to move up in weight to be considered a “real” great?